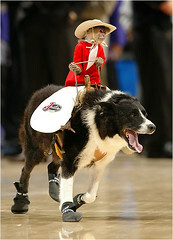 Itchmo: News For Dogs & Cats » Blog Archive » Who’s The Monkey Now? This entry was posted on Friday, May 18th, 2007 at 11:00 am	and is filed under Other Pets, Dogs, National Dog, Cat & Pet Info, Art & Pictures of Cats & Dogs. You can follow any responses to this entry through the RSS 2.0 feed. Both comments and pings are currently closed. I feel sorry for the little monkey, being forced to wear clothes and to perform in a “circus” type environment, for humans to laugh at. You can bet your bottom dollar that the monkey is not having a very good time, and being trained to do these stupid tricks very likely involved some beatings or other training “techniques” that you’d all be screaming about if they were used to train a dog or a cat. IMO, exotic animals should never be kept as pets nor should they be used in the “entertainment” industry. The “poor baby” is Whiplash. And you are clueless. He was NOT trained using beatings or other “techniques” that anyone would scream about. In fact with out his clothes he will go climb on the dogs and wait for a ride. He grooms the dogs and they him. Another case of speaking without knowing the facts!